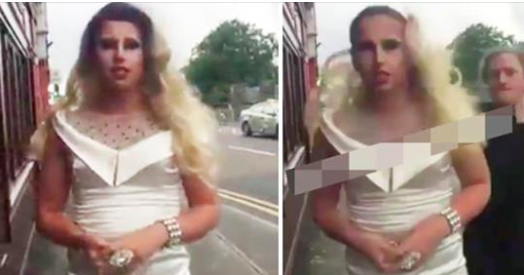 A video a drag queen knocking out a guy on the street after he rips off her wig was recently uploaded to Ebaumsworld.com and received nearly 75,000 views in less than 24 hours. The queen is Dublin-based performer Heirless Blackstone, and she clearly means business. Two Irish media websites wrote about the incident over the weekend. Oddly, both of the articles have since disappeared. Spooky. Of course, without context, it’s unclear what Heiress is actually talking about. Some are saying the video is a publicity stunt. We’d argue that, if this was a publicity stunt, Blackstone really hasn’t done a very good job at promoting it. Either way, it’s a warning that all should heed — especially if you tend to get sloshed in gay bars. He wasn’t a “Rude Man” He was a bigot who verbally assaulted her and put his hands on her. Why is the author trying to minimize that? Did it hurt when he yanked your wig off? There you go again….dont you get tired of yourself? This is a fake. The pearls have been clutched. Awwww, how adorable, the same screenames (Mo Bro’s alternate screenames) Who hyperventilated and screamed out that Trump and Melanie were being viciously bullied when people commentd on their marriage or said Trump was fat, are here trying to claim that somebody getting assaulted on the street is nothing. Because once again, you’re proving you aren’t “Conservative Gays”, you’re just anti-lgbt trolls that are on here to attack the community and defend bigotry at any opportunity. BriBri, did it hurt when they yanked your nuts out of their sack, baby? you COULD BE wrong. It’s plausible that’s a real assault, and a real right punch in the face. Imma go with fake. I don’t think the guy is close enough to hit with a bent arm. You’re guessing. It COULD BE real. first of all, she should learn how to securely attach her wig. second, if anybody thinks a drag queen can’t deck a guy never worked with some of the queens did. Not to split hairs, but this was a battery, not a mere assault on her; much worse under the law. It seems like only yesterday when I posted the video showing how violent drag queens can be at Pride parades and other venues once irritated or drunk. I’m tempted to post it again for nostalgic reasons but I think for now I’ll let it rest. Isn’t this a bit silly?? I mean, really? I know that the community is well & truly tired of the ignorant antics of the ignorant-bigots out there, but do we have to stoop so low as them? Oh look, a posting saying that defending yourself when a bigot has committed battery on you is “Stooping to their level”. That’s exactly what the right wing bigots want. LGBTs back in the closet and afraid to defend themselves. No, it isn’t. Keep your hands to yourself. PERIOD. Any fool knows you’re safer harassing a gym queen than a drag queen.